This article first appeared on the cover of Vertical Magazine’s October/November 2018 issue. Story by Oliver Johnson. Read the digital edition here. 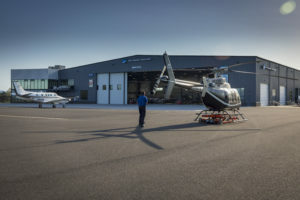 Having spent more than 30 years turning a single-helicopter company into one with a fleet of 90 aircraft, with charter operations joined by a service center, aircraft sales and management, parts sales, a fixed-base operator (FBO), and one of the largest helicopter schools in the world, you’d perhaps have excused Max Lyons and his team at Hillsboro Aviation for being satisfied with their lot. But it’s clearly not a company that’s content with merely maintaining the status quo. So, within the last four years alone, it has sold its flight school, built a brand new 51,000-square-foot headquarters, and, with a view to capitalizing on a whole new branch of aviation services, launched a UAS division. These are hardly the signs of a company that’s resting on its laurels. 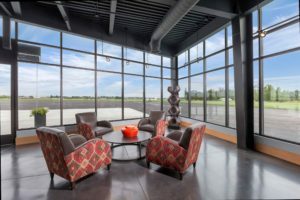 A visit to Hillsboro Aviation’s spectacular new headquarters, located on the northern edge of Portland-Hillsboro Airport, is a visual treat. Built to accommodate environmentally friendly designs, including plans solar panels, electric vehicle charging stations, and LED lighting, the facility includes a 32,000-square-foot hangar with white floors, radiant heat, and 5,000 square feet of adjoining shop space; four acres of ramp and parking space; and a 14,000-square-foot office and FBO facility. 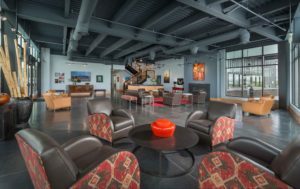 The answer to the question was found through architect Aron Faegre, aviation facility specialist Centrex Construction, interior designer Kathy Wharton, and Lyons’ wife Carol, who helped select furnishings and artwork. Their combined efforts resulted in the building winning an award from Varco Pruden — one of the leading suppliers of steel building frames in the U.S. — as “Best of Category” for a transportation facility. The company broke ground on the new facility in August 2015, and a rapid construction process resulted in Hillsboro being able to move into its new home just 10 months later. 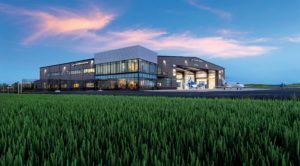 As an FBO, Hillsboro sells Avfuel, offers hangar space, aircraft detailing, courtesy cars, catering, maintenance and avionics services. The amenities it offers include a private ramp, flight planning, an exercise room and shower, a pilot lounge and use of a conference room. Today, the FBO is one of five core business units at Hillsboro, joined by contract and charter services; aircraft sales and management; a service center; and parts sales. Woven into the fabric of all five is the secret to Hillsboro’s success over almost four decades — the importance of developing and maintaining long-term relationships with its customers. The company was founded by a former Robinson Helicopter production test pilot in 1980. Then known as Hillsboro Helicopters, it operated as a single-helicopter flight school using one of the first serial number Robinson R22s. Lyons, a fourth-generation logger, began what would become a lifelong association with the company as a customer in 1983. 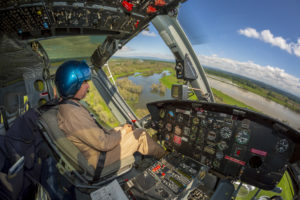 After learning to fly with Hillsboro Helicopters and gaining his license, he returned in 1988 to join it as a flight instructor, while also flying utility operations. Shortly afterwards, he was appointed head of the company’s Japanese pilot training program. With a particular affinity for Asian culture, he developed key business partnerships in the continent, bolstering the company’s training program. 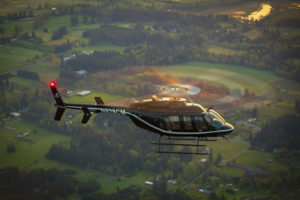 But it was the enrollment of another student pilot that would fundamentally shape the future for both Hillsboro Helicopters and Lyons himself. Ed Cooley, who had led Precision Castparts to become a Fortune 500 company, arrived at the school as a student pilot. Lyons taught him to fly, and in 1992, Cooley decided to turn his newfound passion for helicopters by purchasing the company — and appointing Lyons as general manager. Cooley adopted a mentorship role with Lyons, and the two brought a new business philosophy to the company, emphasizing the importance of developing relationships with customers. 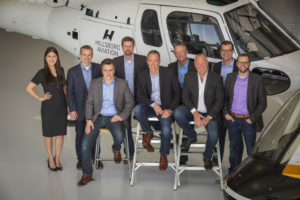 The company became Hillsboro Aviation in 1996, reflecting the growth in its operations that had taken place, with fixed-wing operations augmenting its rotary-wing work in a variety of sectors, along with the addition of sales and service divisions. The Lyons family purchased the company from Cooley in 1999, and Hillsboro Aviation continued its growth, becoming an operator, service center, sales agent and FBO that, at its peak, employed 285 people, had a fleet of 90 aircraft, and worked with customers from more than 75 countries. Then, in 2013, Lyons was approached by Renovus Capital Partners of Pennsylvania, who made an offer with Graycliff Partners of New York for Hillsboro’s flight training business. Sensing an opportunity to shift its sole focus to its charter, sales, and service divisions — expanding its service offerings, international reach, and customer experience — Lyons said the timing was right and chose to split the company, selling the flight school in late 2014. Despite the changes to its business, diversification is still core to Hillsboro’s strength and a key part of its strategy going forward. Its wide-ranging expertise is reflected in its various certifications and approvals, under Federal Aviation Administration parts 135 (airplane and helicopters services), 133 (external load operations), 137 (agricultural operations), and 145 (repair station); and it is a U.S. Department of Defense Commercial Airlift Review Board (CARB)-approved air carrier. An early adopter of safety management systems, Hillsboro is also qualified at stage 2 of the International Standard for Business Aircraft Operations (IS-BAO). Having flown over 1.2 million hours since its founding, Hillsboro has vast experience in its work. Its 65 employees (rising to 85 during the fire season) also bring an enormous amount of experience to their roles, with those in management having an average of 18 years in the industry, pilots averaging 20 years, and mechanics and aviation technicians, 21 years. The company’s key operating sectors are firefighting, search-and-rescue, aerial construction, LiDAR, powerline and pipeline surveys, scientific support, seismic and exploration, executive charter, aerial cinematography, and burgeoning UAS operations. Its 13 rotary and fixed-wing aircraft include four Bell 205 A-1++ aircraft, two Airbus H125s, three Bell 407s, two Bell 206B-3s, one Bell 206L-3, and one Beechcraft King Air C90. All are owned by Lyons, who operates the company with a philosophy of maintaining as low a debt as possible. Hillsboro’s operations take it right across the United States. Along with its headquarters in Hillsboro, the company operates from different remote bases throughout the year. The number and location of these vary based on contractual requirements, but have recently included a pilot and aircraft contracted to Teton County Search and Rescue of Jackson, Wyoming; an aircraft on a Department of Defense contract in Fort Irwin, Texas; construction, heli-skiing, and lift projects; and numerous aircraft on government contracts during firefighting season. This year’s fire season was a particularly busy one for Hillsboro — as it was for much of the aerial firefighting fleet in North America. “At one point, we had 10 of our 12 helicopters out on fires. We thought 2017 was an anomaly; 2018 is busier — our busiest ever,” Seth Hansen, Hillsboro’s director of business development, told Vertical. However, while the glut of firefighting work is definitely a positive in terms of keeping the aircraft busy, Hillsboro is keen to not be reliant on it as a source of revenue. 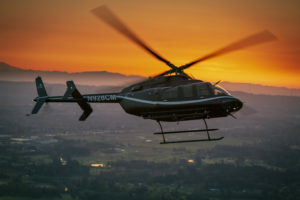 In years gone by, seismic work was a significant source of revenue for Hillsboro, occupying six or seven helicopters year-round. Today, with the mineral exploration sector having endured a downturn alongside that of the oil-and-gas industry, the situation is quite different. It was Hillsboro’s diversification that made it possible for the company to remain profitable throughout the recession, said Lyons. 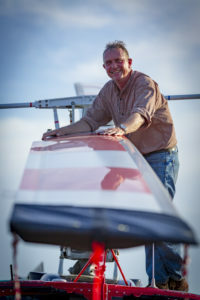 The newest branch of the company’s operating division is its UAS work. Hillsboro’s UAS operation uses the DJI Inspire and the DJI Matrice for various data collection jobs — primarily for companies working in construction and agriculture. Hillsboro is seeing a whole new customer group for its UAS service, rather than finding existing customers are switching to UAS from manned aircraft. “We’re finding customers that were using other avenues to collect data that may have been less accurate, and this new technology allows them to go out and acquire more accurate data at a much lower cost,” said Hansen. 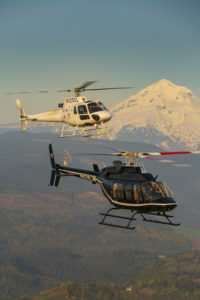 Beyond its role as a fleet operator, Hillsboro has developed an international reputation as an aircraft broker, recording over 1,000 sales of fixed- and rotary-wing aircraft. According to Lyons, the goal is to expand this side of the business with more fixed-wing sales for aircraft such as King Airs and Cessna Citations. 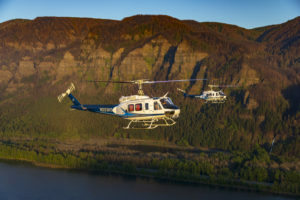 In 2016, Hillsboro became the first — and to date, only — commercial sales agent in the U.S. for Airbus Helicopters, with responsibility for Alaska, Colorado, Idaho, Montana, Oregon, Washington, and Wyoming. Aircraft sales is another area in which the company feels the benefit of developing and maintaining relationships with its customers. 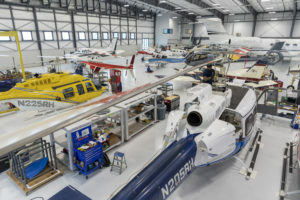 Through its years as the owner of one of the largest helicopter flight schools in the world, it established connections with pilots at their entry point into the industry, many of whom have subsequently gone on to leadership roles throughout the U.S. and around the world. 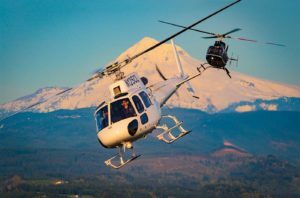 Parts sales has been one of the more rapidly-growing parts of Hillsboro’s business, spurred by a renewed focus on the division as the company purchased the tooling and equipment of Heli-Trade Corporation in 2012. 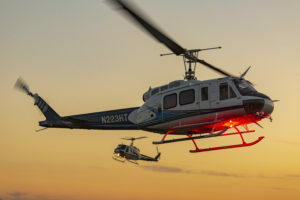 Heli-Trade was known for its repairs, service, and aftermarket upgrades for the Bell 205/UH-1, and the purchase brought 12 supplemental type certificates for performance enhancements on the Bell 205 and UH-1 (turning a standard 205 into a 205 A1++), as well “a building full of parts for Bell mediums” under Hillsboro’s roof. However, its parts inventory is certainly not limited to the 205 — or even to Bell — as it spans more than 50 manufacturers, vendors and suppliers. 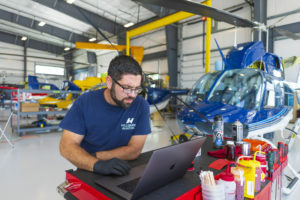 This variety is also reflected in Hillsboro’s maintenance and avionics services, where it has the expertise to work on helicopters, jets, turboprops and piston aircraft, and is an authorized service center for Bell, Cessna, Cirrus Aircraft, Robinson Helicopter, Lycoming, and Goodrich. Lyons also highlighted the potential of international CARB business for bringing in new work, “but we have to find the right opportunities to do it,” he said. When the right opportunity for growth does appear — whether in the form of CARB work or another sector — Hillsboro has the capability to physically expand with it, with a total of 425,000-square-feet of property available for long-term development potential. Hillsboro Aviation also includes the next generation of Lyons, through Max’s daughter Rekha. Having joined the company as director of marketing and communications, she has spearheaded a rebranding of the company that launched earlier this year.